He may not have intended to send it to us and he probably can figure out who Brian Karas is, (e.g., on LinkedIn). His objection was to us criticizing his company in a recent post about their competitor Sharp. The problem is: Knightscope is reckless. They are a danger to themselves, to the emerging security robot market and, by extension, to the security industry as a whole. And the biggest upside to that is people find it entertaining, like this YouTube video clip where a passerby compares Knightscope (which also makes sounds like a movie prop) to Star Wars BB-8. Knightscope may seriously have a future as an (extremely expensive) gimmick / toy far more than for its claims to stop violence or crime. Doing a trial at a mall across the street from Silicon Valley's largest VCs is appealing to a fund raising startup. But despite initial good press, the trial was a disaster when the Knightscope robot ran over / into a toddler and then tried to spin the incidence. Knightscope either did not know, or responsibly factor in, that putting a 'trial' robot into a mall with loads of people would present risks. And then their spin job 'field incident report' made it worse. But, thankfully, it did make clear publicly a critical limitation in using their robots. As part of their 'investment' campaign, they are promoting the social media campaign #stoptheviolence. Unfortunately, there are zero examples of Knightscope stopping any violence or even a clear theory about why a rolling can with cameras could reasonably stop violence. Certainly, he is not the first unscrupulous vendor to link horrific tragedies to their products but it remains absurd. What will their robot do to prevent mass shootings? 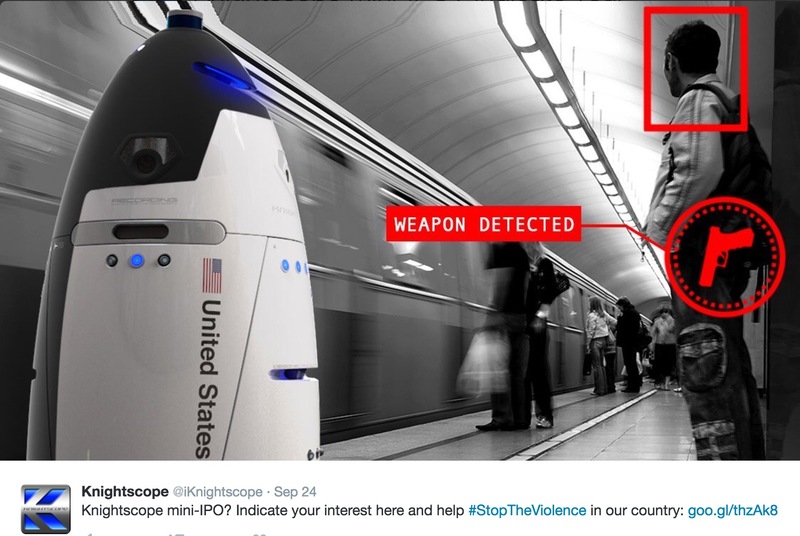 As a 'solution' to this, Knightscope has started claiming that they will develop gun detection analytics. Of course, gun detection (and from the image above evidently hidden guns) is another reckless stunt, given how hard of a problem that is to solve and zero evidence they are close to doing so. IPVM is certainly 'pro' security robot. The ugly race to the bottom in video surveillance is a threat to the industry and innovation. Security robots, at least in concept, have great potential to revitalize the security technology market. The problem is the gimmicks and reckless marketing that Knightscope, and Stevens as their marketing leader, specializes in. The nascent robot market risks damaging its reputation like video analytics did. Yes, you can do stunts at first to get people excited. But as video analytics showed, the stunts eventually wear off unless real value is delivered. Worse, once the initial excitement wears off, the disappointment / bad taste can remain for years. Like it or not, Knightscope has made themselves the 'face' of the security robot industry and if they do not mature, they risk harming the reputation of the whole security robots market as a gimmick rather than a real force for the entire security industry.